John Dubaz (1853-1931), the progenitor of the Dubaz family of the Mississippi Coast, was born ‘Giovanni Dubaz’ in 1853, the son of George Dubaz in the village of Viganj on the Pelijisac Peninsula of Croatia. In April 1868, at the age of fifteen he applied for his ‘permesso di vaggio’, which was a permit to travel as a merchant seaman in lieu of military service or conscription. The permit was issued on the 20th day of September 1870, at the port of St. Marks at Curzola, the capital city of the island of Curzola which is known today as Korcula. On the 16th day of November 1870 in Trieste, Italy, John Dubaz signed aboard his first ship as a common seaman. It was the Austro-Hungarian bark, Ciano. He served aboard the Ciano one year and nine months, leaving her on 11th September 1872 at Caspoli, which was Constantinople, which is known today as Istanbul. While still in Istanbul on the 24th of September 1872, he signed aboard the bark, Geisppal, serving aboard her for a period of sixteen months, during which time he was elevated to the rank of able bodied seaman. John Dubaz left the Geisppal on January 14, 1874 at Trieste, Italy. On May 12, 1874, back at his home port of Korcula, he signed aboard the bark, Ida L and sailed to Istanbul where he left her September 23, 1876. On January 18, 1877, John boarded the bark, Presidente, bound for Marseille, France. He left the Presidente in Marseille and on 18th May, 1877, he boarded the bark, Elano, which was bound for Lovanno. He left the Elano at Venice, Italy on May 25, 1878 and signed on the bark, Ivy Kate, which was bound for his home port of Korcula. On November 22, 1879, John Dubaz signed aboard the bark, Viganj, which was named for the Croatian village of his birth. After being prompted to tomoniere, which is helmsman or head steersman, John Dubaz left the Viganj at Cardiff, Wales on January 31, 1881 and boarded the bark Fabrrlon bound for New York. He arrived in New York on June 10, 1881 and eighteen days later signed aboard the bark S.S. Strossmayen bound for Tralee, Ireland. Here Helmsman Dubaz left his ship and boarded the Delmazia, a bark, bound for Glasgow, Scotland and Istanbul. On April 17, 1884. John Dubaz debarked the Labioncello at Pensacola, Florida never again to sail the world’s seas on a tall ship. Shortly after arriving in America he met and married Mary Magdlen Lee, the daughter of James and Sarah Lee. Mary or Maggie, as she was called, was seventeen years of age at the time of their nuptials. She was born November 29, 1870 and John Dubaz was eighteen years her senior. From this sacred union five sons were born in Escambia County, Florida: George Dubaz, born November 23, 1887; John Dubaz Jr., born January 26, 1890; Rudolf ‘Doffie’ Dubaz, born March 7, 1892; Lawrence Dubaz, born March 4, 1892; and Luke Dubaz, born February 11, 1897. Lawrence Dubaz, the fourth son, was called Larenzo, died only seven days following his birth. * This information was compiled by John B. Dubaz, the son of John Dubaz Sr. from the permesso which he obtained in November 1979 from Mary Rose Dubaz Leahey, his cousin, the granddaughter of John Dubaz Sr. Between 1886 and 1903, John Dubaz owned two stores in Pensacola, Florida. The first was located at Romano and Alfonse, and the second was located at 10th and Gregory. In 1903, the Irving family, which was very dear friends of the Dubaz family, convinced John Dubaz that he could be very successful at Biloxi, Mississippi. He could have his store and his boys could also work in the oyster business. So he and Maggie and the boys moved to Biloxi by boat. The name of the vessel was the ‘Maggie-K’. 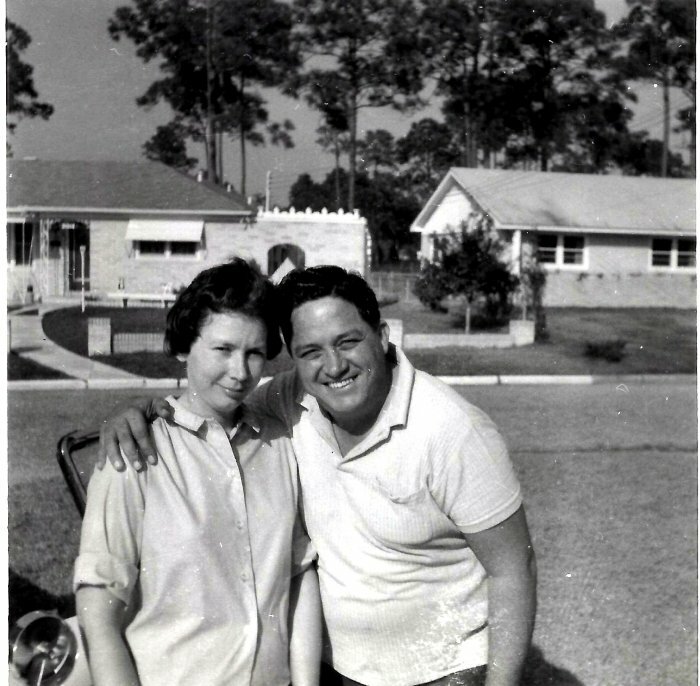 She was owned by Tom Powell and his wife who brought the family to Biloxi. When they arrive in Biloxi in early 1903, George Dubaz was sixteen years old; John Dubaz was thirteen; Doffie was eleven; and Luke Dubaz was six. The first house that they lived in was the Wesley house at the corner of Cedar Street and East Beach. It is known today as the Holy Angels Nursery. They stayed there about one and one-half years and then moved across the street to a four-room house with a dormer. It was located where St. Michael’s Catholic Church is presently located. John Dubaz then acquired a lot at 1417 East 1st Street and started building the Dubaz family residence, which was completed in 1905, at a cost of $200. The home today is owned by Aunt Lillie, the spouse of George Dubaz. In the year 1907, the old St. Michael’s Church was built across the street from the family home. The contractor was Delmas Seymour. After the church was completed, Mrs. Seymour played the piano for the church and Doffie Dubaz started taking piano lessons from her. George Dubaz then decided to take fiddle lessons so Professor Hammersbach from St. Stanislaus College came every Monday from Bay St. Louis to teach him and others music. John Dubaz took coronet and trumpet lessons. As thing turned out, all four boys became very accomplished and very popular musicians. They had their own orchestra as George played violin, Johnny played trumpet and cornet, Rudolf played trombone, piano, bass violin and alto horn while Luke was the band’s drummer. Circa 1910, the Dubaz brothers joined the Biloxi Herald Band and played for many years. In 1914, Doffie Dubaz and Luke Dubaz decided to try the retail side of the seafood business. They opened a shop at 1417 East Beach on land owned by Charles McCaleb. 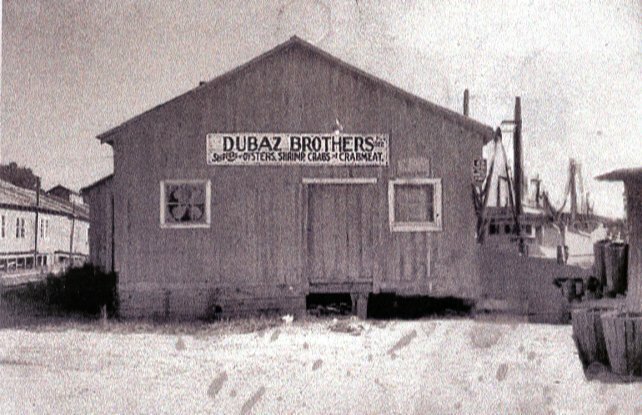 George and John Dubaz joined the business in 1915 to form the first Dubaz Brothers shop. On May 17, 1915 Rudolf Dubaz, the third son, wed Ella Scanlon, the niece of Mr. and Mrs. William Martens. 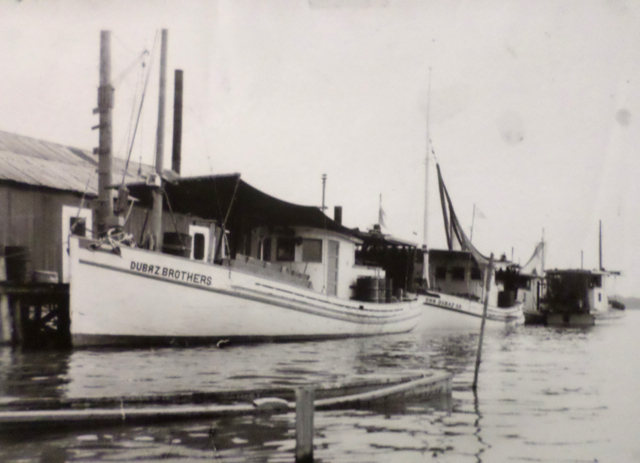 In 1916, the Dubaz boys relocated their business to Back Beach [Back Bay] on property owned by the Ott family. About this time, John Dubaz Sr. closed his store next to the family home on 1st Street and it became the headquarters for the Point Cadet Social Club [PCSC]. In the latter part of 1917, the Dubaz Brothers closed their seafood shop because of WW I. George and John Dubaz enlisted in the US Army. Rudolf stayed in Biloxi and worked for the Cruso Canning Company. Luke Dubaz found work at New Orleans and Pascagoula, Mississippi at shipyards building ships for the war effort. WW I ended in November 1918 and in 1919 the Dubaz brothers began to get reorganized in earnest as they reopened their seafood business on Back Bay and also purchased the Valpino crab shop. There were also two marriages in 1919. 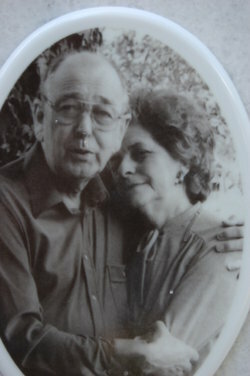 The second first generation marriage occurred when Luke Dubaz wedded Inez Gable, the daughter of William E. and Willomenia Gable on February 20th. A short while later the third first generation marriage took place when John Dubaz Jr,, the second son, wed Cecile Andre, the daughter of George and Laura Andre on March 3, 1919. Shortly after these marriages, Doffie Dubaz decided to get out of the business and work for himself. In 1927, the Dubaz boys sold the two businesses on Back Beach and built a new factory on East Beach on property owned by Ernest Mladinich. They grew a fleet of eight fishing boats. John Dubaz Sr. died on February 1, 1931. Mary Magdeline Dubaz followed him in death passing on June 30, 1932. Both were interred at the Biloxi Cemetery. The fourth first generation marriage took place when George Dubaz, the oldest son, wed Lillie Wescovich, the daughter of Peter Wescovich and Mary Ellen Ross Wescovich (1881-1956) on February 24, 1937. For the next seven years the Dubaz family prospered and the second generation was growing fast. By this time, there were five second generation marriages. In early 1944, John Dubaz Jr., my father, succumbed to an illness and never recovered. He died on July 7, 1944 and is interred at the Biloxi Cemetery. In 1969, only two of the Dubaz brothers, George and Luke, remained in the seafood business. Although Doffie Dubaz wasn’t in the business, he worked right along with them. In August 1969, Hurricane Camille destroyed the their business on Biloxi’s East Beach so they relocated their enterprise to Back Bay, almost exactly where it had been in 1919. In 1976 sadness again visited the Dubaz family when on January 28th, George Dubaz, the oldest son expired. He was interred in the Southern Memorial Park cemetery. As of the last day of this writing, April 19, 1980, first generation members of the John Dubaz Sr. family living are: Cecile, Rudolf, Ella, Luke, Inez and Lillie Dubaz. **From information furnished by Rudolf ‘Doffie’ Dubaz, the third son of John Dubaz Sr.
John Dubaz married Mary Magdalene Lee (1870-1932), the daughter of James and Sarah Lee, and a native of Santa Rosa County, Florida. They had five sons all born in Escambia County, Florida: George Dubaz (1887-1976) m. Lillie Wescovich (1909-1999); John Dubaz II (1887-1944) m. Cecile Andre (1899-1986); Rudolf Dubaz (1892-1981) m. Ella Scanlon (1896-1988); Lawrence Dubaz (1895-1895); and Luke Dubaz (1897-1985) m. Inez Gable (1902-1994). George Dubaz (1887-1986) married Lillian Wescovich (1909-1999), the daughter of Peter and Mary Ellen Wescovich on February 24, 1937. In March 1919, John Dubaz Jr. (1887-1944) married Cecile Andre (1899-1986) and they were the parents of: Alma Lucille Dubaz m. Gilbert Woodman Griffey ; Eunice Dubaz m. Conger ; Lillian Katherine Dubaz m. Jones R. Pierce Jr.; John B. Dubaz (1929-2006) m. Alice Julia Bellande (1931-2013); Beverly Dubaz; and Martha Ann Dubaz m. H.M. Weaver. Lawrence Dubaz was born March 4, 1895. He expired on March 11, 1895 in Florida. The Daily Herald, “Dance and Reception for Columbus Day”, October 13, 1911. The Daily Herald, “Deer Island” [advertisement], August 6, 1915. The Daily Herald, “Brilliant reception last night in honor of Bishop Gunn”, February 2, 1912. The Daily Herald,“John Dubaz, Sr. Dies”, February 16, 1931. The Daily Herald, “Austrians Buy Canning Plant”, July 30, 1932. The Daily Herald,“Mrs. Dubaz Dies”, July 30, 1932. The Daily Herald,“John Dubaz Dies”, July 7, 1944. The Daily Herald, “Ernest Mladinich Dies”, January 20, 1953. The Daily Herald,“Mrs. Catherine Mladinich”, October 22, 1962. The Daily Herald, “Dubaz seafood company sold to Biloxian”, January 8, 1973. The Sun Herald, "Inez Gable Dubaz", January 16, 1994. The Sun Herald, “Edward R. Hanson, Sr.”, April 6, 1996. The Sun Herald, “Don Dubaz”, November 16, 1996. The Sun Herald, “Lillie Wescovich Dubaz”, April 19, 1999. The Sun Herald,“Luke J. Dubaz Jr.”, April 23, 2001. The Sun Herald,“John B. Dubaz”, April 1. 2006. The Sun Herald,“Lawrence G. Dubaz Jr.”, May 3, 2010. The Sun Herald,“Alice Bellande Dubaz”, January 22, 2013. The Sun Herald,“Lawrence G. Dubaz Sr.”, August 28, 2013. The Sun Herald,“Iris Dubaz Roberts”, March 12, 2014. The Sun Herald,“Michael R. Dubaz”, April 2, 2018.